This year marks the 100th anniversary of the Latvian declaration of independence from Russia following the end of World War I. The brief period in 1918 opened up a window of opportunity for the three Baltic States -- Estonia, Latvia and Lithuania -- to assert their freedom and sovereignty from foreign powers that occupied them for centuries. In 2018, the countries actively engaged the world by cooperating with one another, promoting democracy and human rights and contributing to the rules-based international order. While increasingly becoming liberal societies, they have also developed and innovated their economies and broadened trade partnerships with far-flung economic powerhouses. Latvia in particular -- the only Baltic nation to have a resident diplomatic mission here -- celebrates the spirit of the 1918 independence declaration with Korea, a country that experienced a similar course of history and now increasingly seeks innovative partnerships with Riga, according to Latvian Ambassador to Korea Peteris Vaivars. 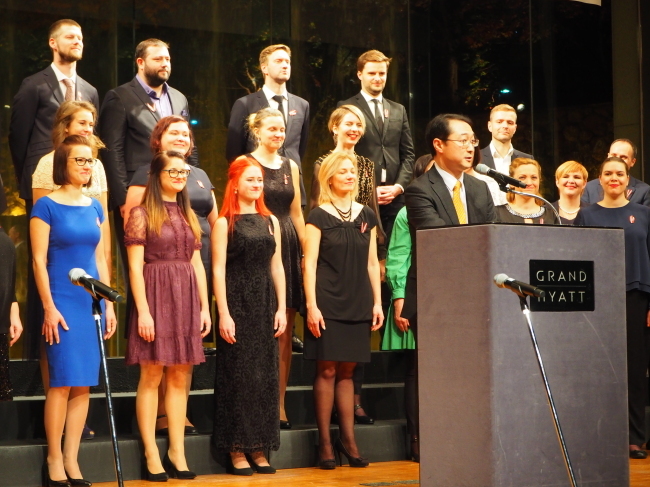 “Thank you for your friendship, cooperation, devotion and love towards Latvia,” he said at a National Day reception in Seoul on Friday in front of some 500 guests, including numerous foreign ambassadors and dignitaries. 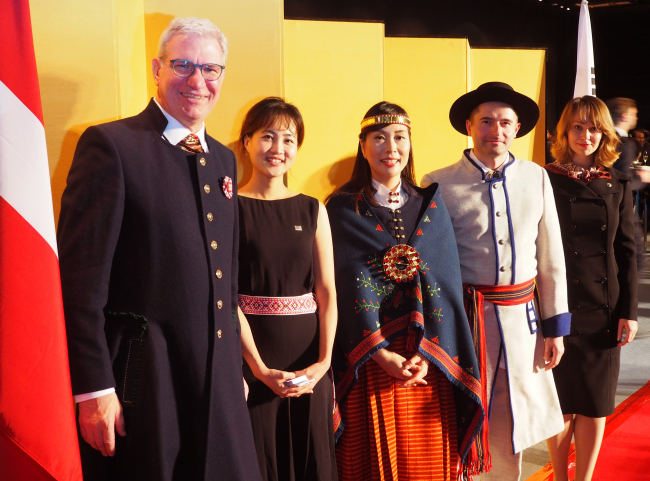 Noting that this year is “very special for Latvia, Korea and the whole world,” the envoy highlighted that Latvian President Raimonds Vejonis had attended the opening ceremony of the PyeongChang Winter Games and held a summit meeting with President Moon Jae-in. Vejonis was accompanied by Latvia’s Deputy Prime Minister Aseradens, Foreign Minister Rinkevics and Defense Minister Bergmanis. Vaivars, the first Latvian resident ambassador here, said Riga looks forward to a future visit by Korea’s head of state and head of government, which has yet to occur. He was previously posted to Tokyo as the top Latvian diplomat, also overseeing Korea. At the reception, the Emils Darzins Mixed Choir from Latvia sang both countries’ anthems and Latvian songs. Riga and Seoul attained full membership at the United Nations on the same day -- Sept. 17, 1991 -- and established diplomatic relations a month later. Pointing to the bilateral air services agreement signed in September following the two foreign ministers’ meeting in New York, he said the accord would significantly boost trade and investment. On Nov. 6, the Latvian Embassy in Seoul signed a memorandum of understanding with the Korean Bar Association to promote bilateral legal cooperation. “The sentiment here provides a good background for explaining our history, given that Korea underwent colonial occupation similar to us. We are a deep-rooted nation in Europe, and our language is also one of Europe’s oldest,” Vaivars said in an interview with The Korea Herald, mentioning periods of foreign rule by Germany, Sweden, Russia, the Polish-Lithuanian Kingdom and the Soviet Union. Under the Soviet occupation, which lasted from 1940-41 and 1944-91, Latvia operated several embassies abroad, including embassies in the United States, the United Kingdom and Argentina. Following the dissolution of the Eastern Bloc in the early 1990s, Latvia became a vibrant democracy and market economy. Turning to today’s Latvia, the diplomat said popular support for European initiatives, liberal democratic values and the market economy has grown, casting off its decades-old Soviet legacy. Latvia is a multiethnic society with 62 percent of the population being Latvian, 26 percent Russian and the rest mostly Belarusians, Ukrainians, Poles and Lithuanians. The country is a member of the UN, European Union, North Atlantic Treaty Organization, Council of Europe, World Trade Organization and Organization for Economic Cooperation and Development, among other global institutions. “Our survival depends on the liberal, rules-based international order and cooperation in multilateral frameworks,” he said, adding that political and military neutrality is unfeasible for a country like Latvia. 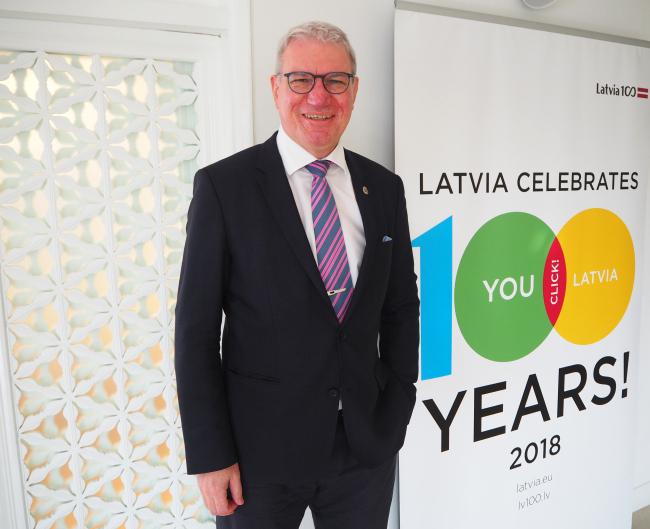 On the growing relations with Korea, with the two countries poised to register a bilateral trade volume of $100 million this year, Vaivars said his job is to create “waves of awareness” here by promoting Latvian athletes, artists and celebrities and engaging with local media. Over the past 27 years, the two countries have bolstered cooperation in commerce, culture and community ties. The envoy highlighted exchanges in music, art and design and sports in particular. Around 10,000 Koreans are expected to travel to Latvia this year, and the number will significantly increase after Korean Air opens direct flights between Riga and Incheon next summer. The Latvian capital, Riga, has well-preserved architecture dating back as far as the Middle Ages, earning it the nickname “the Pearl of the Baltic Sea.” Designated the European Cultural Capital in 2014, the city has one of the largest collections of Art Nouveau buildings in the world. The capital’s historic center was designated a UNESCO World Heritage Site in 1997, with many buildings constructed between the 16th and 19th centuries. A major trading hub for northern Europe since its founding in 1201, Riga is the largest city in any of the Baltic States and home to one-third of Latvia’s 2 million people. The city offers a myriad of festivals and performing arts throughout the year, including choral, opera and ballet concerts and art exhibitions.